Strollers are an important part of your child’s safety and comfort, especially in their early years. There are many different types of strollers on the market today, each offering a vast array of features and options. How do you know which to choose? 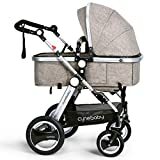 Whether you are going to the mall or traveling by plane to introduce your new bundle of joy to your family, you need a stroller that can be relied on to meet all of your—and your child’s—daily needs. Traditional: Traditional strollers are what every other model is based off of. 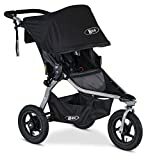 These are the simplest strollers, but come with many different features and customization options. These can include roomy seats, deep recline, storage areas, good-sized wheels, and many (if not all) can be converted into a travel system. Models can weigh anywhere from 16 to 32 pounds. Combo: This type of stroller is a hybrid and has the base of a stroller chassis with wheels. These models allow for a lot of customization and can be used from the day your baby is born until they no longer need one! Some combos are sold as a complete package—chassis, bassinet, and reversible seat—but sometimes they are sold separately. Travel system: A travel system has a car seat, a base for the car seat that goes in your car, and a stroller. These models are best when used for newborns, and while they may be bulkier than the average stroller, they offer many good features. If your child falls asleep in the car, you can easily transport them into the stroller and continue on your way without the worry of waking them up. 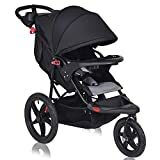 Jogging stroller: This stroller has three wheels and allows you to take your child with you as you go for your daily morning jog. These models feature a hand brake as well as a foot brake to slow down or stop the stroller. 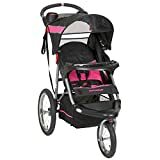 The wheels can be fixed to suit your jogging needs, whether you like to have a more maneuverable stroller or a fixed position. 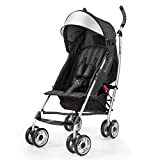 The stroller also features a tether strap that keeps you and the stroller connected, so that if you trip or fall, the stroller will not just go traveling away on its own. Umbrella stroller: This type of stroller is lightweight and easy to fold. Great for traveling around with your toddler, this stroller should only be used by children over six months old. Durability: The frame should be made out of a lasting material, such as metal or aluminum, in order to keep the stroller’s support in place. The fabric should also be easy to clean and should be able to last. 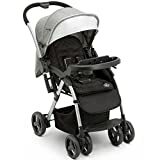 Weight limit: Strollers have a weight limit in regard to comfort and safety, and it is important to try out the stroller to assess how your child appears to look while in it. 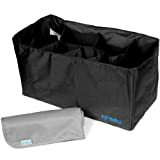 Storage: Many people found it helpful to have storage space for extra things like diaper bags, cups, snacks, etc. As your baby grows older, they will need different things from their stroller. From 0 to 6 months old, your baby needs neck and back support, and many new moms have given great advice on what to use during this time, suggesting that it’s best to buy an infant car seat and a car seat stroller frame. For those doing more traveling, newborns do well with travel systems. From 6 months to 3 years old, your child is going to have an increased desire to see and do everything possible, and at this point it is important to consider your lifestyle when selecting a stroller. You are going to have options, including a jogging or an umbrella stroller. 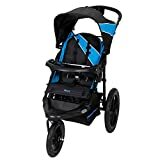 You may find that you need to make adjustments or buy additional items in order to fully make the most out of your stroller, but a basic model is a good place to start if you do not know how life is going to pan out. BOB: Started in 1994 by making bike trailers for children. Today, it is a go-to company for jogging strollers. Graco: Has made juvenile products for over 50 years, and makes it easy to shop online with their comparison chart. Britax USA: Offers many different varieties of strollers, all made with the safety of you and your child in mind.